Travel back in time to conquer nations on a Viking Voyage. Click here to play! If you can survive on the seas and the fierce battles with these Nordic men you'll be rewarded with treasures beyond belief! You'll have to keep an eye on your fearsome leader: the Viking with the golden beard and horned helmet. He only appears on reels 1 and 5, but he acts as a substitute symbol that will replace all other symbols, except scatters, to create more winning combinations. Fair maidens will also help you in this voyage. Two to five of these lovely ladies on a pay line will pay out up to 5000 times your original line bet. The double handed broad axe will also come in handy with two or more rewarding you with up to 2000 times your original line bet. Golden coins and goblets will also payout with each getting you up to 1000 or 500 times your bet respectively. As with all voyages, you'll surely run into a few surprises, but don't worry because it's a good thing. Longboats not only act as a scatter that will multiply your total bet, but they will also trigger a re-spin feature that will hold triggering reels while the rest re-spin up to 10 times. Can you handle this Nordic adventure? Join the Vikings for a chance to bring home a hefty prize! The Viking longboat acts as a scatter. Two ore more of these anywhere on the board will multiply your total bet up to 25 times. Three or more anywhere on the board will trigger up to 10 free games. 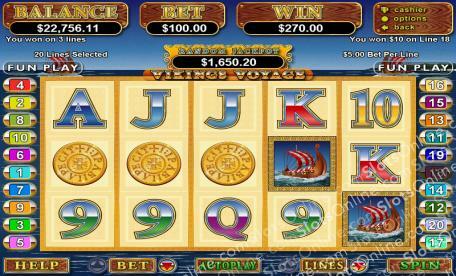 Prizes are doubled during free spins and if two or more longboats appear, a re-spin feature is triggered. During re-spins, scatters will trigger additional free games. The fearsome Viking acts as a substitute. He only appears on reels 1 and 5 but will substitute for all other symbols, excluding scatters.